On Wednesday evening, FreedomWorks was proud to host a town hall meeting with Congressman Thomas Massie in the Cincinnati suburban community of Erlanger, Kentucky. The event was co-hosted with the Northern Kentucky Tea Party, a group of local grassroots activists fighting for fiscal responsibility, limited government, and free markets. Mr. Massie has a lifetime FreedomWorks score of 94%, indicating a pristine pro-liberty voting record. In introducing Mr. Massie, FreedomWorks’ National Director of Grassroots Noah Wall described his leadership, standing strong for conservative principles against a congressional establishment content with the status quo of cronyism and big government. In conjunction with the House Freedom Caucus, those efforts recently began to come to fruition -- first, with the recent resignation of John Boehner from the Speaker’s chair; then, with establishment favorite Kevin McCarthy’s withdrawal from the leadership contest. 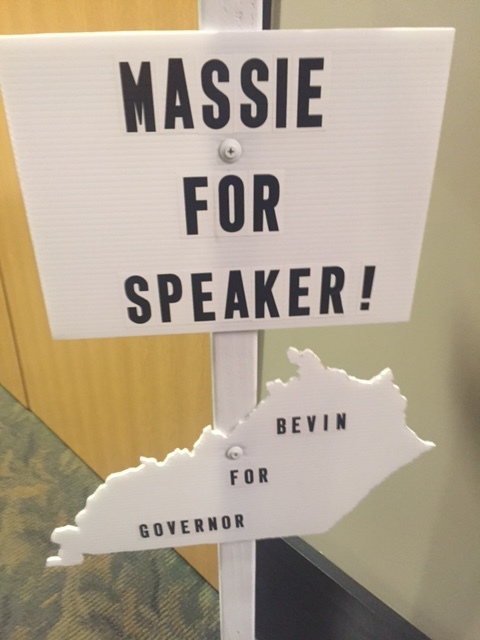 Interest in the Speaker’s race drew much attention Wednesday evening, drawing over 100 activists from Kentucky’s Fourth Congressional District and the surrounding area to attend. Mr. Massie celebrated the successful efforts of grassroots activists in forcing Mr. Boehner and Mr. McCarthy to recognize principled conservatives as a force to be reckoned with, before going on to explain the prospects of electing a more effective leadership. Though rumor has it House Ways and Means Committee Chairman Paul Ryan, who has a lifetime FreedomWorks score of 81% is considering jumping into the race, the only announced candidates remain Congressman Jason Chaffetz of Utah, who owns an 88% lifetime rating, and Congressman Daniel Webster of Florida, with a score of 64%. The House Freedom Caucus as a whole has chosen to endorse Webster’s candidacy, as has Congressman Massie, due to the open process Webster promoted as Speaker of the Florida State House in the 90s. FreedomWorks has yet to make an endorsement in the race. Massie also commented on another major victory for the grassroots. On Wednesday, current House leadership announced potential changes to procedural rules, opening up the legislative process to more principled members who have been marginalized under Speaker Boehner’s tenure. According to Politico, the contents of a letter co-written by Representatives Cathy McMorris Rodgers and Luke Messer spell out plans to address concerns voiced by the House Freedom Caucus. "We heard clear and consistent messages about the need to follow ‘regular order,’ open up the process, and empower individual Members.” FreedomWorks strongly supports efforts to make the Republican Conference a more decentralized, bottom-up organization, with a leadership that reflects the consensus within its membership. Recent events should give ordinary Americans cause for jubilation. Despite the claims of naysayers, the hard work of patriotic activists across the country has certainly paid off. First Cantor, then Boehner, and now McCarthy. The fight ahead for true conservative leadership looks promising. FreedomWorks is proud to announce that our bill of the month for March 2019 is the End Pensions in Congress (EPIC) Act, H.R. 191 and S. 438, sponsored by Rep. Thomas Massie (R-Ky.) and Sens. Mike Braun (R-Ind.) and Rick Scott (R-Fla.). The EPIC Act would terminate pensions for members of Congress, and force them to save for retirement in the same way that most private Americans do, by responsibly contributing to 401(k)-type plans. On behalf of FreedomWorks’ activist community, I urge you to contact your representative and urge them to cosponsor the Federal Reserve Transparency Act, H.R. 24, if he or she hasn’t already done so. Introduced by Rep. Thomas Massie (R-Ky.), the Federal Reserve Transparency Act would require a full audit of the Federal Reserve by the Government Accountability Office. FreedomWorks is proud to honor Rep. Jim Jordan (R-Ohio) as our member of the month for August 2018. He serves in the House of Representatives for Ohio’s 4th Congressional District, located in the north-central and western portions of the state. His district is the eastern neighbor of Ohio’s 8th Congressional District, formerly held by ex-Speaker of the House John Boehner. The 2018 midterm cycle is already shaping up to be a tough year for Republicans in the House, with many predicting a “blue wave” this fall and speculating that the GOP will lose its majority because of it. However, there is a simple fix for this: a change of party leadership. A choice is looming large in front of the GOP: Who will succeed Speaker Paul Ryan (R-Wis.) as the top House Republican? WASHINGTON, DC - FreedomWorks, in conjunction with the Competitive Enterprise Institute (CEI) have issued a combined 2000+ comments in support of a petition to create a new category of consumer dishwashers not subject to onerous efficiency standards. Such standards have caused dishwasher cycle times to increase by roughly 150% on average since the 1980s. The comments period, which was open for several weeks, closed yesterday. On behalf of FreedomWorks’ activist community, I urge you to contact your representative and urge him or her to vote YES on the free market amendments that have been offered to the Agriculture and Nutrition Act, H.R. 2, more commonly known as the “Farm Bill.” The amendments below are important parts of the conversation on this legislation, and will steer the Farm Bill in a more fiscally responsible direction, with less government intervention in the market. Last week, Speaker Paul Ryan (R-Wis.) announced that he would not seek re-election. His future had been an open question. He was essentially recruited to take the gavel of the chamber after Speaker John Boehner (R-Ohio) called it quits in October 2015. FreedomWorks today announced the FreedomFighter Award winners for 2016. The FreedomFighter Awards recognize members of the House and Senate who consistently vote to support economic freedom and individual liberty. FreedomWorks President Adam Brandon and FreedomWorks Vice President of Legislative Affairs Jason Pye presented the awards Wednesday afternoon at the Capitol Visitors Center. Photos of the individual presentations are available here.